We can’t stress this fact enough—a household’s central air conditioner needs professional maintenance every year. 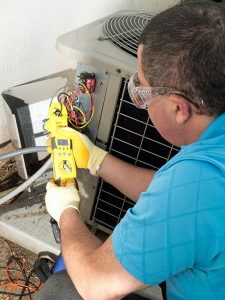 These annual appointments give HVAC technicians the opportunity to inspect the air conditioner and handle basic tune-ups, cleanings, and adjustments. The best time to have this work done is—now! Spring is when most people schedule their annual AC maintenance, and we encourage all our customers to sign up for one of our maintenance plans so they can arrange for this vital work during April or May. We often hear this question. Not only are people unsure about having maintenance in spring, but they are also unsure about having maintenance done every year. Why not skip one year here or there? What’s the harm? It keeps the warranty current. Most manufacturer’s warranties for air conditioning systems require the AC to have professional maintenance annually. Otherwise, the warranty may be voided. Around 2% of AC systems leave the factory with faults, and the warranty protects you from having to pay for repairs or early replacements because of these faults. Letting the warranty lapse because you let maintenance lapse can translate into major costs for repairs or a replacement. It reduces the chance of emergency repair calls. You don’t want to have your summer interrupted by a busted air conditioner. Scrambling to get technicians to your house on a hot summer day to fix the AC is no fun at all. Maintenance makes it unlikely this will happen. It prevents a utility bill hike. A well-cared-for air conditioner is an air conditioner that costs less to run. Maintenance tasks remove the strain on an AC that will lead to an increase in electrical costs over the summer. The longer an air conditioner goes without professional attention, the more it will cost to run. AC maintenance doesn’t have to be a burden for you. In fact, we want to make it as easy as possible so you won’t skip it. There’s no easier time to schedule the job than during the spring. You won’t have to worry about losing the use of your AC during a hot day, and our technicians aren’t overly busy with heating or cooling emergencies during the season. If you’ve signed up for one of our maintenance agreements, all you have to do is call us and we’ll take care of everything else. Another reason that spring is the ideal time for maintenance is that it gets your air conditioner tuned-up right before you need it the most. It’s always a smart idea to have any appliance maintained before it has to put in the biggest workload—such as taking a car in for a tune-up right before a big road trip. A spring AC tune-up gives the system the best chance of making it through summer with zero problems. If you should need air conditioning repair in Bucks County, PA (maintenance can’t prevent every problem), you can trust us to get to you fast and restore your comfort. Carney Plumbing Heating & Cooling offers same day service and a satisfaction guarantee. Sign up for one of our maintenance plans today!